A couple of months ago I was sitting in a crowded London A&E ward with my partner after she had an accident at work. It was the first time I personally witnessed our government’s ‘hostile environment’ at work in the midst of what was once a confidential and unconditionally attentive relationship between our NHS and anyone in need of it; a relationship that was once the envy of the world. I watched these uncomfortable interactions putting up walls and thickening the air with suspicion towards anyone who either wasn’t white or had a foreign accent. And it made my skin crawl, just the same way it crawled when Donald Trump was elected President of the United States. 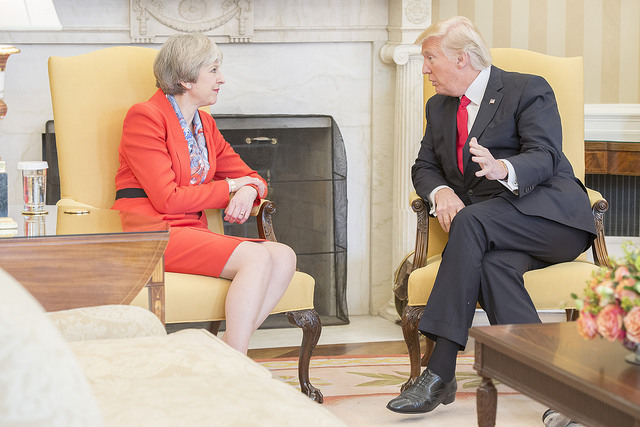 Britain has always liked to consider itself the more civilised partner in our ‘special relationship’ and America the apple that fell a little too far from the imperial tree. But this gives too much credit to our political leaders and not enough to the American people. Consider for example their Cities of Sanctuary, a movement going back to the early 80s when thousands of US citizens helped smuggle undocumented Latin American war refugees to safety in US cities where police were banned from checking immigration status even when someone was arrested. Today that protection is patchy at best and under attack from Trump’s administration. But to human rights advocates in Britain, winning such protections for undocumented people, even in principle, seems near-utopian. Our Prime Minister is publicly devoted to giving undocumented migrants a ‘really hostile reception’, ostensibly to protect the public services her party spend the rest of their time passionately dismantling. And now, perhaps for the first time in living memory, such systematic discrimination is starting to spill over racial lines. EU nationals expressed fear this week after immigration barristers alleged new rules will require them to pay for Comprehensive Sickness Insurance (CSI) and warned they could be deported if they don’t. While the government denies this, grassroots groups have already exposed its criminalisation and deportation of EU citizens for being homeless, branding this an ‘abuse’ of free movement. Polish along with black and Muslim communities have been subject to soaring levels of hate crime and the number of EU citizens incarcerated in detention centres has increased five-fold. And it’s not just migrants forced into this hostile environment. We have seen children of colour targeted by our schools and asked to produce proof of nationality as part of the school census. University students and staff have long sounded the alarm over being strong-armed by the government into acting as ‘proxy border guards’, threatening academic freedom. We’ve seen women forced to prove nationality before giving birth in hospitals and systematic discrimination in the private rental sector, not just against migrants but all communities of colour. We don’t need to look across the Atlantic for racial profiling and discrimination perpetrated not just by some rising right-wing ‘populism’ but by the state itself. The hostile environment is all around us. This, of course, is why Trump’s election evoked such passionate protest in the UK. Progressive and marginalised groups here recognise Trump as an existential threat because they sense the same toxic prejudice pouring out the doors of our own parliament and off our own front pages. There is a relationship between the hostile environment rhetoric and record levels of hate crime reported by three quarters of UK police forces following the Brexit referendum. Yet many people seem to take pride in its creation. That pride comes from a widespread sense among many in the UK with very legitimate grievances around wages, housing and services, that ‘soft touch Britain’ has been taken for a ride and that at last, those days are over. But that sense, relentlessly encouraged by the establishment, is founded on lies. The truth is that conditions for working people in this country cannot improve under a government unwilling to invest in housing, social welfare and decent jobs, particularly not after a financial crash and bank bailout of well over £100 billion. The bailout has been diligently wiped from the national memory but if we’re looking for the hole in the public purse, we need look no further. And as long as critical research is ignored and migrants continue to be blamed, without any improvement in people’s lives this downward spiral of scapegoating, street violence and social breakdown will likely continue. But communities are pushing back. Right to Remain is supporting migrant and refugee groups to build strong support networks, find their voices and feel supported to campaign for change. We also support a wide range of independent groups working to raise awareness and opposition to the hostile environment in universities and schools, in hospitals and in the streets. We take inspiration from the incredible mass mobilisations for migrant solidarity and the Black Lives Matter movement. And we believe that the upsurge of grassroots opposition to Trump here has the potential to grow into a meaningful movement effecting real change – but only if attention can be re-focused closer to home. Indeed, holding his closest ally accountable for the way her hostile environment is tearing families and communities apart is also the best way for people here to mount effective opposition to Trump.